On Saturday, March 18, PESA member companies (Halliburton and Cudd Energy Services) and two non-member companies – met with U.S. Congressman Beto O’Rourke (D-TX) during his visit to Midland. 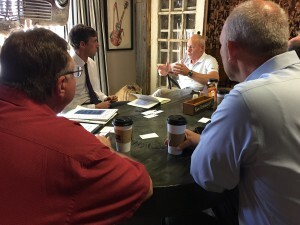 Congressman O’Rourke, who represents El Paso, wanted to meet with PESA member companies to get a better understanding of some of the environmental issues associated with shale operations. Chris Gatjanis (Vice President Permian Basin, Halliburton) served as host for the event. The participants provided an overview of industry challenges during the peaks/valleys of the markets and discussed their hiring of veterans (a priority of the Congressman). The group provided insights on hydraulic fracturing operations and explained why freshwater contamination was geologically impossible. The group indicated that it was premature to draw conclusions between hydraulic fracturing and earthquakes. The Congressman was pleased to learn that more than 150 of his constituents work in the Permian Basin. The meeting with the Congressman was a follow-up to a discussion PESA had with his staff during the Washington, Fly-In (February 28). PESA welcomed the opportunity to continue the discussion with Congressman O’Rourke on issues critical to the oilfield service sector.